You are here: Home / Cancer Treatments / Is Vitamin C Cancer Therapy Effective? In the modern age, the concept of preventing and treating disease through nutrition has fallen by the wayside. What was once medicine has been relegated to (at best), an adjunct in favor of chemical-based pharmaceuticals, which are now the accepted standard of medical treatment. But a new study published in the peer-reviewed journal Science reiterates what science in the public (rather than corporate) interest has been saying for at least the past 50 years… that vitamins and minerals, not drugs, are what our bodies need for true healing. Researchers at Weill Cornell Medicine in New York City investigated an alternative therapy that is often regarded as “quackery” by the allopathic community. This therapy has time and again proven itself to be effective in the treatment of certain forms of cancer. This treatment is known quite simply as vitamin C − a nutrient found primarily in citrus fruits like lemons and oranges. And it’s proving to be a major breakthrough in the eradication of cancer. According to the study’s findings, vitamin C is highly effective in the treatment of colorectal cancer, which claims the lives of some 50,000 people annually. And it’s particularly effective in the treatment of colorectal cancers bearing both KRAS and BRAF gene mutations, which happen to respond quite poorly to conventional therapies − including chemotherapy. Lead author Dr. Lewis Cantley and his team learned that amounts of vitamin C equivalent to what you might find in about 300 oranges is enough to impair the growth of both KRAS and BRAF gene-mutated colorectal tumors. This army of antioxidants literally enters the malignant cells, prompting an attack response marked by so much oxidative stress that the cells burn out and die. And they do this in a rather interesting way that was previously inexplicable by science. Rather than attack cancer cells directly, vitamin C compounds appear to convert into another oxidized substance known as dehydroascorbic acid, or DHA. The DHA tricks cancer cells into accepting it for entry. Only once it gains access, this DHA is converted back into ascorbic acid (a type of vitamin C), causing cancer cells to essentially commit suicide. This is great news for cancer patients, as it presents potential new options for longevity and survival that conventional medicine simply can’t offer. But there’s just one problem… the amounts of vitamin C needed to obtain these amazing therapeutic benefits can’t be obtained from basic oral consumption of vitamin C. This is because the human body is only capable of assimilating so much of this nutrient at one time into the bloodstream. 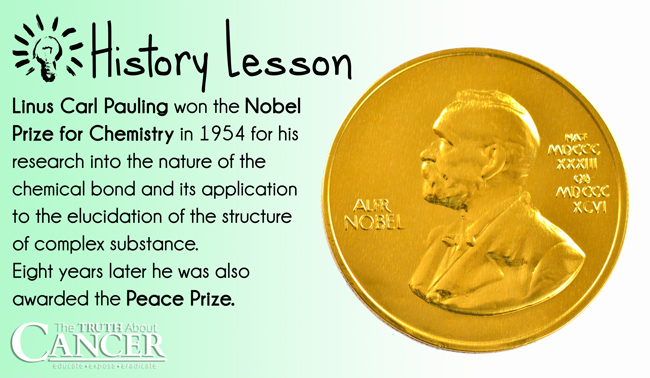 This is where the groundbreaking work of the late Nobel Prize winner Linus Pauling, a biochemist from Oregon State University, comes full circle. Pauling was among the first within the scientific disciplines to flesh out vitamin C’s many potential uses in modern medicine. This included its effectiveness as an intravenous treatment for cancer and various other major health conditions. As it turns out, intravenous administration of vitamin C delivers far more of this important nutrient into the bloodstream than oral consumption, bombarding affected tissues and cells with disease-eradicating doses of this powerful, natural medicine. Pauling and his colleagues first pioneered this technique by administering it to more than 1,000 cancer patients, with incredible success. Despite facing a constant tide of ridicule and slander from his less progressive colleagues, Pauling forged ahead. They laid the groundwork for what is now considered by many forward thinkers in the medical profession to be the gold standard for high-dose vitamin C therapeutics as a viable treatment for chronic and degenerative disease. “[Ewan Cameron] and Pauling found that vitamin C helped cancer patients live about four times longer than cancer patients not given vitamin C,” writes Dr. Ronald Hoffman of the Hoffman Center in New York City, a clinic that utilizes high-dose, intravenous vitamin C drips as part of its progressive cancer treatment protocols. This isn’t to say that taking vitamin C orally is of no beneficial effect. 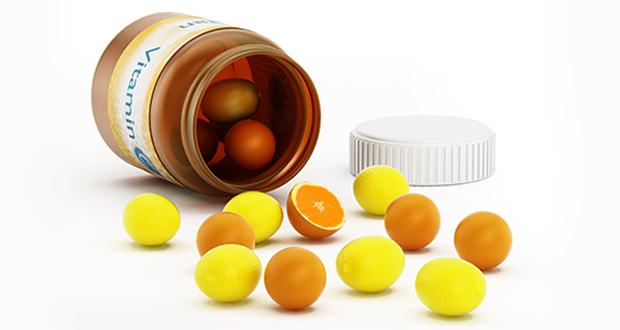 To the contrary, high-dose oral intake of vitamin C at tapered doses (Dr. Hoffman says blood levels “max out” at about 500 milligrams (mg) doses) can help maximize your body’s immune system and aid in tissue repair. But when it comes to effectively treating cancer, intravenous administration is the only way to go. Bypassing the body’s digestive buffers allows intravenous vitamin C to spur the production of hydrogen peroxide deep within bodily tissues. And with the help of disease-fighting white blood cells, this “peroxide-mediated” vitamin C, as Dr. Hoffman puts it, performs unique and key functions in the targeting and eradication of cancer cells wherever they might be lurking in the body. Even the National Cancer Institute (NCI) is onboard with the science behind IV vitamin C therapy. It admits, based on laboratory studies, that vitamin C is capable of helping to slow the growth of cancer cells in the prostate, pancreas, liver, and colon. Both animal and human studies have also shown that IV vitamin C therapy can help block tumor growth and improve patient quality of life. My advice if you currently don’t have cancer is to up your oral intake of vitamin C for prevention purposes. Citrus fruits are great for this, but “superfoods” like camu camu berry and acerola cherry are even better. 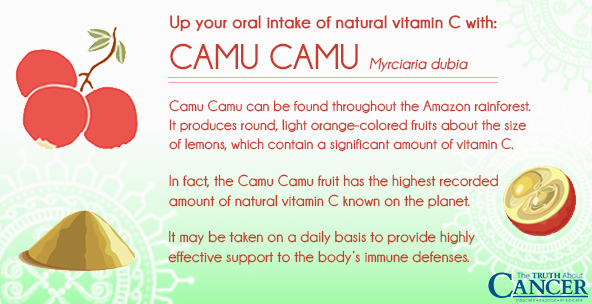 Camu camu is said to have some of the highest natural, food-based levels of vitamin C − upwards of two grams of vitamin C per 100 grams of fruit! If you or someone you love does have cancer, you may wish to investigate the merits of high-dose, IV vitamin C therapy as a possible cancer treatment option. Vitamin C − a nutrient found primarily in citrus fruits like lemons and oranges is proving to be a major breakthrough therapy in the eradication of cancer. Vitamin C is highly effective in the treatment of colorectal cancer, which claims the lives of approximately 50,000 people annually. 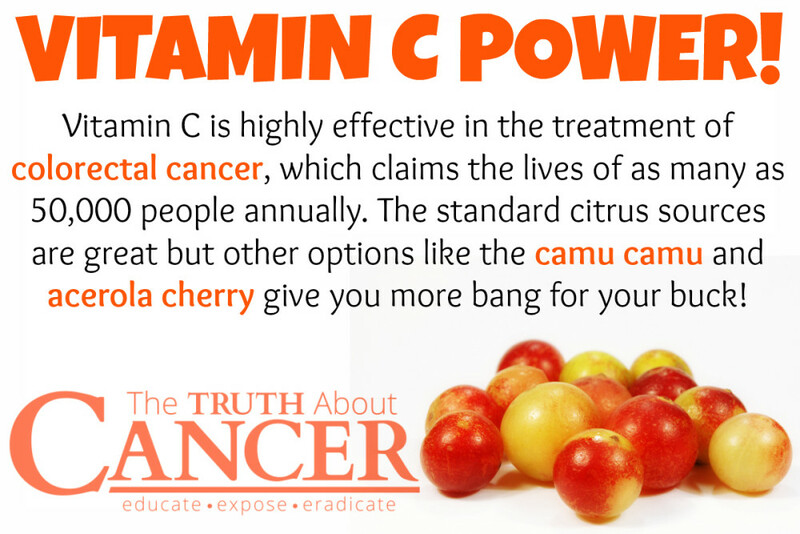 Linus Pauling found that vitamin C helped cancer patients live about four times longer than cancer patients not given vitamin C.
Both animal and human studies have shown that intravenous vitamin C therapy can help block tumor growth and improve patient quality of life. If you don’t currently don’t have cancer, look at increasing your oral intake of vitamin C for prevention purposes. “Superfoods” such as camu camu berry and acerola cherry are even better sources of vitamin C than citrus fruits. If you or someone you love has cancer, you may wish to investigate the merits of high-dose, IV vitamin C therapy. I buy Liposomal Vit C at Amazon. It comes in packets, one packet a day (it’s not a pill, but a sort of syrup). Don’t buy it, make it yourself. very easy and fresh. But use Sunflower Lecithin not Soy Lecithin. And if I was to actually buy it, I’d get it from Marcola dot com. How do you make it? Thank you. We sometimes use iv-c for our cat rescue work and have run into the ‘buying’ aspect. our veterinarian would write us a prescription but he refused to take responsibility for the aspect of providing any help other than administering and monitoring which he insisted he had limited ideas on such specialties. So we read up on the Belfield & Stone procedures as well as got a copy of Klenner’s Clinical Handbook (his research annotated by Lendon Smith) and a bunch of others and found out that we needed a certain concentration for IV-C and some other dosing and such ideas. Including that you need to get it from a compounding pharmacy who does the C in PRESERVATIVE-FREE form. Hope this will make your own path a bit easier. Dont really understand but need to. Could you possibly email me with more information? Please. I definitely agree that nutrition helps heal from Cancer. I’ve had it 3 times-was given 2 weeks to live 6 years ago-and thanks to prayer and my nutrition-I seem to be free of Cancer at this time! Thank you for giving us new information! Pls look into the Riordan Clinic in Kansas! I’ve seen some very informative videos done by Riordan on Youtube. Plus their website has explicit instructions for cancer therapy that you can take to your doctor if somehow you find one who will do it. For example, after calling and googling, it appears there may be only one or two such MDs in the Cincinnati area. That appears to be typical for middle america. But Riordan is a valuable resource for making it more likely even if you cannot travel to Kansas. Hi there. Wonderful well-researched website, and nicely layed out also. Please consider adding the research of Professor Margreet Vissers of Otago University New Zealand to your database/articles. It wasn’t mentioned in the article above, so I would like to know if anyone has used this type of therapy to treat Multiple Myeloma? Any studies done? Hello, Im so sorry you or a loved one has Multiple Myeloma, my mother had this disease. “Magnolia Bark,” there is amazing Herbs for cancers of the blood and bone. If possible try to see a Chinese naturopath healing begins with the emotions as well. lyposomal Vit C is great! However it does NOTt take the place of IV therapy. I can attest to that. My husbands cancer progressed because we were led astray that they were one and the same effective. NOT! It is great Vit C! I take it for myself but I do not have cancer. My husband has cancer and is taking Vit C IV therapy with DMSO in it plus other vitamins and minerals now! On the off days he takes 4 pkgs of lypsomal Vit C. Please do not think the packets will do the same thing as they will not! Get IV Vit C therapy quickly! Hi Anna – where is your husband getting the Vitamin C IV Therapy? Can you share the details please? Also, I am from India – is there a way to receive this treatment from them in India? Hello! My mother is in great need of a cure for her cancer. she is at her last stage. The chemotherapy didn’t work as expected. please can anyone tell me as to where i can find her the Vitamin C IV Therapy? Greetings, I am single, and eating right is very difficult. I would appreciate links to where to purchase the best supplements. I’ve read that vitamins made in the U.S. are another rip off fraud. I don’t have the time to read all of these books. The source where I read about American vitamins was on a fraud report. Were you able to find anyone in India to administer high dose Vitamin C IV Therapy? My mother-in-law is in need of this but the local Dr. are not very supportive. Hence I am looking for a second opinion. While doing research for myself I just came across these holistic centres that give IV vit c, hyperbaric oxygen therapy and many more. Hope it’s not too late. Hope it helps. To Arpan sarkar and Dwayne Fernandes of India, google Dr Thomas Levy, watch his lectures which are very informative and you should find there his email address. He gave it at the end of one of his lectures. Maybe more than one. You can ask him if he knows of anyone in India who gives IV Vit C treatment. If he says he doesn’t, you can ask him how to get the Vit C ampoules or vials for IV administration. It may be that it can be posted and you can find a doctor in India who is willing to administer it. Also you can get liposomal Vit C posted to you and you can get Vit c tablets in a pharmacy/chemist. As well as tablets find out if the pharmacy can supply Vit .C powder in the form of sodium ascorbate or magnesium ascorbate. These are all taken orally (by mouth) . They can be taken as well as the the IV treatment. You can ask doctor Levy about how much to take i.e, the dosage and I can tell you it is high! The article mentions “500 mg”, that is a minute dose for IV, are you sure it isn’t supposed to be “500 G”? The article states the 500 mg is where the body naturally “maxes out” on an oral dose. That’s why the IV therapy is necessary. I have multiple myeloma. Is there a track record of success treating MM with intravenous C? Cancer……Ozone oil/liposomal Vit C/no gluten/dairy/soy/sugar/GMO/food with a label…taking vitamins/good oils/minerals…probiotic…LDN..detoxing may help the immune system. Essiac/mushrooms/ginger (has Vit C)/Vit D3 5000IU/sunlight (no sunscreen which is chemicals that may cause cancer)/Zn/Mg/fish oil/coenyzmated B vitamins/juicing and more may help cancer. Time release Vit C helped my precancer get smaller. A person needs to wean off slowly anything that stimulates the immune system. Th1 foods may help instead of Th2 foods. Amour thyroid/good water/eating organic/low stress and more may help. There are books about Vit C helping cancer…it makes lymphocytes increase. Some Vit C in supplements maybe from GMO. A person needs a good source of Vit C. Real organic fruit that is low in sugar like lemon/lime/cranberry/rhubarb may help. Detoxing with Now brand- Detox support/Far Infrared Sauna and more may also help. Hair test…restore any minerals low and detox any heavy metals on the hair test may help. Best wishes. I too would like to know about MM success. My husband has been diagnosed and we both have always been against traditional cancer treatment so..Natural or less toxic is our only way to go.. I have gone to Oasis of Hope in Tijuana, Mexico for 6 years. They give all their patients 2 viles of Vit. c each day plus B17 and Oxygen-ozone therapy, thermal therapy and more. Go to their website. They are in a good part of Tijuana 2 blocks from the beach. They have wonderful doctors. The patients come from all different countries. They pick you up at the airport at San Diego. They are wonderful people. My husband was DX with Grade IV Glioblastoma in July, 2013. He’s been getting IV Vitamin C since August of 2014 and is still going strong. The fact that he is alive over 3.5 years later is truly a miracle. He gets 100G each time and now goes about every 10 days to 2 weeks. Just IV Vit C only or also do chemo ? How is the petscan result? Been going to a naturopathic oncologist for about 7 months taking IV-C weekly @ about 50,000 Mg vit C per infusion. There will be a blood test required to see if you can tolerate hi-dose C then you are slowly built up to a dose that is read on something like a glucose meter , you’re looking for a number at least above 350 to 400 I ended at 430 …with a dose of 50,000 mg C.. Vit-V mimics glucose and Cancers , many of them gobble up glucose. 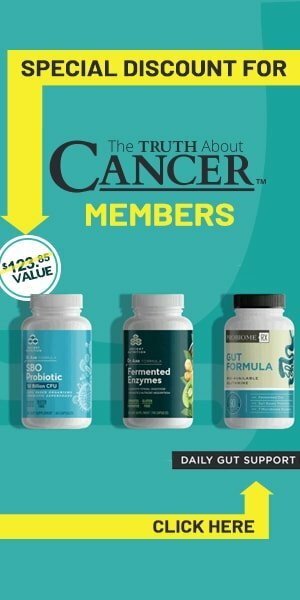 so this is how C targets Cancer.. the cancer cells try to convert Vit C to glucose but can’t so in the process end up self destructing , but cancers can learn to feed on many other substances in your body as well ….such as fermenting amino acids etc.. so its a combination of a many pronged approach of total diet change and tons of supplements . Eventually your diet changes little by little , not for me yet! but I have come off of some supplements… there’s more to it than that though than IV-C which includes Far Infrared sauna ,Hyperbaric oxygen and magnetic acupuncture . I don’t do the Hyperbaric oxy any more i’ve discovered ways to raise O2 levels and I don’t care for the acupuncture … My son loaned me his Far Infrared sauna so I save $$ there and is convenient.. I go the Naturopath off ice once a week 15 mins up the road for IV-C and p/u supplements with a 15 min consult every 4 months.. hope this helps someone ! If you have an aggressive late stage cancer don’t try to do it alone unless you have to.. at least get some guidance from a naturopath , I email mine weekly and discuss a variety of options . During my last visit he sort of complimented me by saying I ask good questions and keep him on his toes… It’s never too late !!!! Sugar may block Vit C…same pathway. Low sugar helps the immune system. Ozone is cheaper than Hyperbaric chamber and raises oxygen. H202 food grade (need proper dilution) may raise oxygen. Cancer can’t live in high oxygen conditions. Best wishes. I wish that IV Vitamin C therapy and liposomal vitamin C be used to cure all kinds of cancers at all four stages instead of the ghastly chemotherapy and radiation therapy. I would not be so afraid to have cancer, even if it was stage 4, if I did not have to do conventional therapies. Vit C is great help for the immune system as long as sugar is low so it can work better. Fear/stress may use up B vitamins/Zn and steal progesterone. Staying happy/low stress is needed. People may also need to change their diet. Celiac diet may help the immune system. Fixing all the root causes…estrogen dominance/gluten/sugar/soy/low thyroid…may need to detox…may need to change lifestyle to lower stress…sunlight/exercise….healthy relationships etc maybe needed. Fish oil/Zn/iodine/Mg/Vit D3/probiotic/Vit B12 with intrinsic factor/Amour thyroid/mushrooms/Essiac/ginger etc all may help. A person may need many things to help restore/rebuild the cells to work right. No gluten may help intestines heal so more nutrients absorb. Juicing may help. 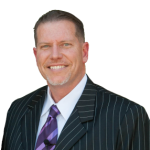 I didn’t eat fruit for 10 years,…then got precancer which went away when I started to eat fruit again. God put fruit on this earth which are different than vegetables which help keep a person healthy. Supplements are great, but still food has many things not in supplements. People can heal with natural help. Best wishes. Look up Ann Cameron on Google. She and others have cured their stage four colon cancer through juicing five pounds of carrots a day. She is a children’s author and wrote a book called Curing Cancer With Carrots. The book is on Amazon and has 117 great reviews and some of the reviews are from people who also had cancer and were successful. Me too, I want to know that is there any success of treating multiple myeloma with vitamin c therapy. If you google livon labs you can order liposomal vit C. It comes in 1 gram packets. Important to change diet to the best – lots of fresh vegetables and fruit, organic if possible. Eat a lot of it raw. Berries are high in anti oxidants so are very good. Friends of mine had been picking pounds of black berries a day which were growing wild on their property so they were eating heaps every day and they were invited to to a beach with friends. They didn’t have any sun screen and it was a clear, hot summer day. They were in the sun for three hours and did not get sun burned at all which was amazing. They remembered hearing in a doctor’s lecture that if you have a diet high in anti oxidants it would prevent sun burn. They reckoned it must have been the black berries. So in the spring when I was able to eat a lot of berries from my garden – a mixture of blue berries, raspberries, strawberries, young berries, and boisonberries, I worked out in the garden, in the sun gor hours and did not get burned at all. I used no sun screen. Later on, when the berries were not as plentiful so I wasn’t eating as much per day anymore I did get a little burned one day. That is just an example of how good and protective antioxidants are. As for the amount of berries, I think I would have gas a heaped cupful a day when supply was at its best. Is there any success in treating multiple myeloma with vitamin c therapy. My granny is diagnosed with MM ,4 months back.She undergone a course of chemotherapy (velcade). Please suggest any alternative therapies to save her. EDTA/DMPS IV chelation or Vit C IV are awesome help. The EDTA/DMPS helped my poison ivy go away/unclog my blood vessels/lowered my heavy metals/chemicals in me. It is like a miracle when I do these IV chelations and eyes are clearer. Lead/arsenic/mercury poisoning are common and the IV chelations are great help. Vit C IV helps the immune system/helps detox. People are very happy with the IV’s…are great help for them. There are also IV’s for minerals/Mg/B vitamins and lecithin etc. These are cheap/ available help. Prevention is easier than cure. Alternative help is cheaper than Conventional help. Conventional medicine may not offer these IV’s. It may cost $2000 for a Potassium IV with Conventional medicine, but very cheap with Alternative medicine. Hair tests are better than blood tests to see minerals/heavy metals. People can heal. Restoring missing minerals or helping with Vit C may restore health fast. My husband has been tested and has two different kinds of cancer. One floor of mouth and the other in lungs. I am in India, Delhi. He has taken one chemotherapy so far. I have been researching on the treatment and am averse to traditional methods of treatment. I have heard and read how changing your diet, air , eating organic , juicing , vitamin C and oxygen replenishment can be more curative. Please advice regarding the best treatment and place for the vitamin C as I don’t think that over the counter doctors are available to administer it. How can I also have better oxygen as that also remarkably helps to treat. Someone has mentioned a place in Mexico . Please advise . Fortunate to have found this site. I believe in prayers and today with the most earnest prayers I found this site.